OxiClean Free knows that clothes washed with laundry products containing dyes, fragrances and harsh detergents can irritate sensitive skin. That’s why OxiClean Free is just that - free of dyes, fragrances, harsh detergents and chlorine bleach. Get the stain-fighting power of OxiClean without sacrifice. Removes stains from grass, wine, juice, food messes, blood, chocolate, spaghetti sauce and much, much more! A great alternative to chlorine bleach. 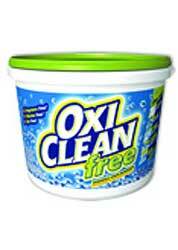 o remove the toughest stains, simply pre-soak with OxiClean Free before you wash.
Also a laundry booster. Add a scoop to every load for extra stain removal power.